This is sort of a sequel to the original Shrek movie, so if you like the original Shrek - this is your chance to see a continuation of that storyline. I won't spoil the fun, but some of the familiar characters are back. Other than that - the 3D effects are nice and 4D effects add a little spark as w..ell, but overall, as 3D movies became very popular - it's not as impressive today as it used to be. It's not too long and not too short so your kids will be entertained the whole time. The pre-show is funny. Revenge of the Mummy is an indoor roller coaster combined with a dark ride. The concept is really good and the twists and turns in the story and the roller coaster itself work well. The dark ride park could have been a bit better as it aged compared to the new rides. Recommended. If you.. like the Mummy the shop outside is great! This is one of the more memorable rides for me. I love the John Williams Jurassic Park soundtrack that plays along and the ride is pretty entertaining. Today it looks a bit outdated, especially considering the new Jurassic World movie is out. Recommended (just not highly). Seeing Atlantis, just standing next to it- is an awe inspiring moment. It is absolutely magnificent and the sheer size of it is something to behold. Even more so the shuttle is surrounded by smaller educational exhibits and you can easily spend half an hour just on this one experience. Highly recomm..ended and not to be missed! Surprisingly intense roller coaster. I really liked this roller coaster. It was fun, fast and exciting. Recommended! Walt Disney Studios Park was a half day experience with some great attractions such as Tower of Terror, Rock 'n' Roller Coaster and Toy Story Land. This year the park opened a new Ratatouille mini-land which is just incredible and unique to this park. Just because of this new addition - it's worth c..hecking out the park again! It's a very nice ride, but the Dinosaurs are a bit disappointing, especially the Diplodocus with the weird movement of its long neck. I think this ride needs to be spiced up a bit, with some added effects. The characters here are unbelievably cool, they are talking, huge and interact in a fun way. If you're a Transformer fan and even if you're not - don't miss this!! When you crave for something sweet - it's a great place to visit. Dudley Do-Right's Ripsaw Falls is just the craziest log flume ride. You'll get soaking wet - and it's so much fun! Highly recommended!! If you don't want to get wet - you can purchase a rain poncho. I heard they are available at the Wizarding World. The breakfast at The Mara might not be on par with the breakfast at Boma, but if you're on a budget and don't have a lot of time - it could be a great alternative. The breakfast was basic but delicious, with one surprise - that chocolate cream filled dessert. Wow! The Dinner at Jiko was superb. I tried the Maize-crusted Monkfish which was delicious. Everything else I tried was great. Recommended! Jiko is at Disney's Animal Kingdom Lodge. The breakfast at Boma was just wonderful. I really enjoyed it - and espcially the French Toast Bread Pudding. The restaurant itself looks beautiful with its African theme. The service is also great. Recommended!! Disney's Animal Kingdom Lodge is an amazing hotel/experience. It has an African theme and you can see the Safari animals right from your room (provided you reserved an Arusha view room). The room itself was beautiful and specious. The bed was comfortable and all the amenities. My only comment is the..re was a certain scent that was noticeable and took some time to get used to (not really a problem). If you would like to stay at Disney's Animal Kingdom Lodge - be sure to reserve a room with a view to the Safari animals. Otherwise you would be paying a premium price and won't experience what this hotel is known for. Try and ask for a floor that is not too high since you would miss the intimate feeling that goes along with being closer to the animals. Finally, the hotel has one of the best restaurants for breakfast at DisneyWorld called Boma and Jiko for dinner. You don't want to miss this. The Ice Cream Parlour looks great and really gives you the will to try one of those yummy tastes. This a more modest alternative to Ollivander's when there are too many people at the other store. This is Universal's parade, with some beloved characters from Despicable Me, Dora and more.. It's nice and very intimate, but I really felt they could have done more with some creativity. For something called "Universal's Cinematic Spectacular" I expected much more. The show is nice and displays a variety of movie clips from Universal's movies. They bring up some nice memories and the soundtrack is great. As for the 'Spectacular' elements of the show - there are a few fi..reworks here and there, but it felt like there is no focus point to the show and show up sometimes when you're looking at the screens and they are behind you, or near you. It's tough to know where to look. It's great that Universal finally offer this kind of entertainment. The clips and the music are great, but I really feel they could have been more creative even within the budget that they had. The Beverly Hills Boulangerie is a nice spot for a delicious dessert. This is an ice-cream place that is meant to look like a Pharmacy place.. ok. It doesn't raise your appetite and the concept is too sophisticated for its own good. A nice Betty Boop store for every Betty Boop need :) The selection is great and the store looks very nice. If you're looking to a special hat - this is the place for you. There is also a nice hat for birthday boys/girls. Recommended! This is an exciting store for comic book fans. It has statues for a famous super villains and super heroes and a nice assortment of related merchandise. Learn about the comedic genius that is Lucille Ball. Interesting and educational. This a James Cameron sequel to Terminator and a really special show. It combines live actors, 3d-projections and special effects. The first time I saw this - I was simply blown away. It's amazing! If you're a Terminator fan - you're going to love this one! This is a very nice store for SpongeBob fans. Its looks very nice and there is a nice selection of SpongeBob items. It's a good store to find the perfect E.T. souvenir and surprisingly - some Back to the Future items. In E.T. Adventure you get to visit E.T. 's planet which looks really great and of course E.T. himself. The ride feels a bit dated, but still very entertaining. It's a nice small Duff related shops. These tank tops look great. I'm not a bug fan of carnival type games, but these look great! There are some very tasty Pizzas at Luigi's Pizza and even for Veggies. Recommended! Kang & Kudos' Twirl 'N' Hurl is a lot of fun. It's a pretty standard ride, but the Simpsons humor that begins in the queue and the crazy alien design and the interactive elements are what sets this thing apart from similar attractions. Fun dark ride where you get to fight aliens and compete with your friend or family. Very nice! About Disaster! : A Major Motion Picture Ride...Starring You! This store has some nice, rare Egyptian items I haven't seen anywhere else. This is a part ride, part roller coaster. Exciting at times, but less in other areas. Super Silly Stuff is THE place to find any Despicable Me souvenirs. When I was there you could actually take a picture with one of the Minions, which was a nice touch. It's a nice shop for Transformers fans. I was expecting a bit more actual Transformers toys, but the selection is still nice and versatile. One of the best shops in the park, it's very big and got everything (Universal related). What a ride! It has a seemless blend of practical sets and 3d projects and special effects. The story is also very nice and original - where you ride vehicle is an actual Transformer and takes part in a war. If you're a Transformers fan like myself - you couldn't ask for more. Perfect! This is a nice roller coaster and the concept of choosing your own soundtrack is great. The problem is with its wait times which is very very long and don't justify the short ride. It's a nice 4-D experience with Shrek. The 3D is great, the movie is nice. Very nice and relaxing visit to Chinese culture. Very very nice! The red pandas are so cute it's amazing! Don't miss those beautiful creatures! Wow! This cable car is worth the price of admission on it's own. The best attraction at Ocean Park! I really like the concept of Ocean Express and also the theming. My big comment is that when there is a high volume of visitors it can be a very tough ride... not fun at all. Very impressive aquarium and one the best attractions at Ocean Park. Not to be missed!!! This is Ocean Park's family roller coaster - which means it's not the most thrilling roller coaster in the park, but still a lot of fun. Recommended! Can you beat a mine train with such a view? It's going to be very hard... Wow - it was just fun - and you can't take your eyes off the view. This roller coaster was fun, but it wasn't that special (aside from the amazing views). The West Coast in Hong Kong! That's a special sight! These playful seals are fun to watch. This was a nice roller-coaster, but I prefer a much smoother ride. Busch Gardens has many great roller-coasters, but this one is one of the best. Very intense, very fast! This is Busch Garden's Safari ride. Our tour guide was fun and the tour was very interesting. This is one the best attractions at Busch Garden. Very cute show for kids which looked very engaged! To say this is extreme is an understatement. It was so cool - you get to the first drop very slowly, it lets you see what's underneath and then the ride starts. Wow - that was amazing!! One of the best roller coasters out there. I tried one of Bengal Bistro's sandwiches in was very tasty. Nice place! The is very relaxing garden area that let's you take a break from all the attraction and see some nice birds. This is a rare opportunity to see these cute Kangaroos (if you're not from Australia). from way up. The spetacular view can also be seen from the different roller-coasters and that's one of the.. things the separates Ocean Park from any other theme park. You can visit a very impressive Oceanarium and a recreation of old Hong Kong and eastern style themed places. The rides and attractions are more for thrill seekers and each one was so much fun to experience. Ocean Park recently opened Ocean Express which is an interesting alternative to the Cable car, a railway with video projections that gives you an other-worldly feel (recommended if the crowd levels are not high). There can also see some rare Asian animals like gorgeous red pandas. They are super cute! Ocean Park is also known for its halloween event called Halloween Bash. The Halloween characters were amazingly funny and entertaining. For very small children there is a limited amount of attractions if you set aside the animal viewing areas, but aside from that- Ocean Park Hong Kong is a must-see attraction when visiting Hong Kong. Instead of having to climb each time to try each slide, the Chairlift takes you there. The beautiful view is just an extra. What an original concept! The whole water park as themed to like a ski resort and it looks magnificent. There is an assortment of water slides and such and they are really fun. I didn't like Summer Plummet that much, but I enjoyed the chairlift there and other attraction. Highly recommended! This is a wild ride - perfect for couples. We got turned over in the end - so be careful. The Teamboat ride was so much fun. It's a long ride filled with some surpruising twists and turns. Wonderful! This ride is perfect for families! This was very disappointing. Summit Plummet is Blizaard Beach's main attraction and I'm sorry to say - I didn't really enjoy it. It takes a few seconds to slide down and I wasn't as fun as I thought it would be. If you'd like to get a tan then Blustery Bay is your perfect spot. It's really nice to just lie there an relax. Crush 'N' Gusher is the key attraction at Disney's Typhoon Lagoon. This was a very unique experience for me. I've never tried a water coaster and WOW it was amazingly fun! It's very fast, very surprising. Recommended. I really loved the Storm Sliders. There are so many twits and turns that you don't know what to expect. It was so much fun! Disney's Animal Kingdom has some pretty terrific attractions with the main ones being: Expedition Everest and Kilimanjaro Safaris. The Tree of Life was under refurbishment when I was there so I couldn't really enjoy it. Even though it was raining that day the Safaris experience was just amazing and ..we got a kick watching one crazy Zebra chasing another animal :) Walking through the park feels very unique and different than any other. It's like traveling to another continent or really visiting Africa. With that said- I don't think the park is a full day experience and that's all going to change as soon as the new Avatar land will be available. This place is very popular so prepare to wait until you find a place to seat there (at least that's how it was when I was there). The food is good, but nothing special. A got myself a Grilled Chicken Sandwich which was tasty. If could rate this show 6 - I would have. It's just a Broadway level eye candy and the story is really good. It combines puppetry and live actors. Very special! There is a wide selection of Dinosaur souvenirs here and I think it's one of the better stores at The Animal Kingdom. Good atmosphere and decoration. Wouldn't it make more sense to use Pterosaurs? Anyway - Triceratops are more impressive and popular so it doesn't really matter. The ride was nothing special, but I still found myself enjoying it. The Dinosaur themed mouse trap type roller is very amusing. There are explnations and warning for each turn and everything looks like one huge maze. A very entertaining wild ride that's exciting to experience and impossible to film :) The shakes and turns are everywhere and there also a nice assortments of Dinosaurs. Recommended! A very nice trail where you get to see some Tigers and other animals set in a beutiful landscape. You can travel at your own pace and there are Cast members who'll be happy to answer any question. Expedition Everest is one amazing attraction. The attraction builds up to story when you first enter it and the attention to detail is just amazing. The ride itself takes a very surprising turn which I won't spoil for you, but the views, the ride and whole experience is just nothing short of spectac..ular. If you get here first thing in the morning the wait times are shorter and you'll be able to use you FastPass+ selections elsewhere. I liked it very much! There was no pressure to meet Rafiki who was playful and charming. The space is pretty big. One thing that was missing was a themed environment to make a picture perfect moment. What a show! The music, the performance the costumes - everything is great and the audience takes part as well. An african celebration that's very colourful and enjoyable. Don't miss it! It a nice trail where you get to explore things and see animals at your own pace. The friendly Cast members are ready to answer your questions. Nice! This is an amazing attraction at The Animal Kingdom where you get to see real animals on the wild. It's an educational but fun Safari ride. I was there when it was raining and contrary to what people might think it is one of the best times to take the ride. The animals love the rain and they come ou..t and play. It's really really nice! At Adventures Outpost you get to have your picture taken with Mickey and Minnie where they live inside a cute cabin. You can also bypass the long wait times by getting a FastPass+ for this. This is a very nice store dedicated to Disney villains. The selection is great and the store looks beautiful and unique because of it's "darker" edge. This is one of the few places I found for Beauty and the Beast item and a stunningly looking Lumière figure. This is one amazing roller coaster in the dark. I like the story - Aerosmith are late to their award show and you have to go with them. Outside there is a huge guitar that looks fabulous. The beginning of the ride is so memorable and fun! I recommend going there first thing in the morn..ing as the attraction is super popular and wait times can become long. This is one of the best attractions here. It's so much fun and you get to compete with your friend or family. The 3D effect is very realistic and the whole thing feels like a good Carnival Games dream. Here you can learn about Walt Disney and his dream. It's a really inspiring movie on the power of persistence and will. The exhibition before the show is also very interesting: you can see very impressive models of different theme park elements and lands such as the new Fantasyland. One model was es..pecially interesting to me - it was the model of The Little Mermaid ride and you can see how the imagineers planned everything. Very interesting! The Legend Of Captain Sparrow is your opportunity to meet Captain Sparrow or at least something that looks like a hologram. The effect is very impressive and the setting was wonderful. A fun show and Johnny Depp was great as usual. There are several photo opportunities at Disney's Hollywood Studios and they look great in the end result. Part of it is because of the surrounding themed environments (the other reason is the wonderful characters). Not sure how the Star Wars merchandise fits here .. and I assume that if it's in Street of America there should be a connection at least to that. I couldn't understand what the shop was about. This was my biggest let down. For such a key attraction I expected much more. It is very dated - and the stunt fx show was a bit embarrasing. I really think they should re-brand the show or add other elements. Maybe they can do the stunt part of the show around Bolt in his set. The go..od parts were the vehicles and props from movies and stories behind it all. The 4D movie is just wonderful the Muppets are having fun and so do you. The pre-show however wasn't that good. It was entertaining at first but was wayyyy too long to the point where I lost interest in the whole thing. It's such a shame because the actual show was really good, crazy and fun. It's a cute playground for kids based on the Honey, I Shrunk the Kids movie with some over-sized elements. You really feel small here and it looks like fun. I wasn't very impressed with this showcase. The only interesting items that were interesting on display were Steven Spielberg's storyboard frames from E.T. (I didn't even know that was possible to display here as Spielberg works with Universal) and Tim Burton's Batman suit. I really loved this place. The food selection is great: I got the herb-crusted salmon and tried the macaroni and cheese and other side dishes and everything was very tasty. The desserts were also wonderful and not too sweet. We got ourself the deal with Fantasmic! which I would recomme..nd because you get to eat a delicious dinner at one of the best restaurants at Disney's Hollywood Studios and get an amazing place to see Fantasmic! Definitely worth it since you can save your FastPass+ for other things and the place that you are seated in is actually better. The food at Backlot Express was very tasty and so was the dessert. I got the Pressed Turkey Club sandwitch which was very tasty and the Chocolate Mousse for desert (recommended!). 50'S Prime Time Cafe is one restaurant you ablsolutely don't want to miss.The whole restaurant is themed around the 50's era with a very home-like atmosphere and playful waitresses that are really proud if you can finish all you food! We only had milshakes here and couldn't even finish half of them... Come here if you're very hungry and going to clean your plate! This is a super-cute interactive show where Younglins can learn about the force and also find the inner strength to resist the temptation of Darth Vader who makes a surprising appearance. This is so cute!! About Indiana Jones Epic Stunt Spectacular! If you can't wait to get to Indiana Adventure Outpost - you can find the Truck near by. There's not much to say about this shop other than there's a much better selection at the Indiana Jones Adventure Outpost. There are some unique items here - like the Indiana Jones Mickey and Indiana Jone costume. When I was there - you couldn't try the Indiana Jones hat because it had protection inside.. but otherwise a very nice store for Indy fans. A display of celebrities' statues. Nice. This is one exciting attraction. You get to go to several of wonderful worlds of Star Wars. You can come back and re-visit the attraction as each flight takes a different direction. Very nice! It's also very exciting to see C-3PO and R2-D2 inside. There is a HUGE AT-AT parked outside so would not wa..nt to miss that. It's a very cute concept. The couple that were driving near by stopped and chatted with the visitors and it was very funny. Wonderful ride through the history of movie making with classics such as Mary Poppins and Tarzan. The show itself is inside a replica of the world famous Chinese Theatre in Hollywood - which is an attraction in itself. Recommended! I had a lot of fun at Disney's Hollywood Studios. They had a huge event for Frozen which was very successful and unique experiences such as: The Legend of Captain Jack Sparrow, MuppetVision 3D, The Great Movie Ride and The Studio Backlot Tour. The Studio Backlot Tour which is supposed.. to be a key attraction at the park was very disappointing. I think they should really update it or at least change the effects stage show which wasn't very exciting. With movies such as Bolt where behind the scenes magic is shown - I could really see how they can create something that's nice and engaging. All in all it's certainly a worthwhile experience: you can learn about the legend that is Walt Disney (very inspiring!) and how animation is made. There are shows such as Beaty and the Beast and Fantasmic! that are extremely popular as well. No visit to Epcot is complete without a taste of the famous School Bread! They are so good!! Sweet and delicious. My Salmon and Egg Sandwich was also pretty good. Highly recommended! This gallery showcase what was supposably the inspiration for Frozen. The movie is so popular and so people visit this attraction although it's not really well done or presented in an interesting way. There is a lot of hype for this ride and I came expecting to be wowed. In the end - it's just a moderate log flume ride that's not very good or interesting. After the ride itself there is a movie about Norway which was even less exciting than the ride itself. Don't waste your FastPass reservation on.. this. The food at La Hacienda De San Angel is great. Although a bit on the spicy side - you wouldn't want to stop eating everything (and that's coming from someone who is not a fan of spicy food). I tried Pollo al Pastor (marinated chicken served with roasted vegetables, beans and pineapple relish) which ..is a very traditional dish. I really like it! The area of the restuarant is also a good spot to see IllumiNations. Nice store with beautiful items and you can also see how some of these get made. A cute cruise ride with Donald and friends. Let's you get a glimpse of some Mexican fun! Nice and relaxing. This store is unbelievably good. It's huge and got tons of really amazing items that are very hard to resist. For Studio Ghibli lovers such as myself, there is a whole section that's dedicated to the movies and characters. This is also an opportunity to see some amazing Bonzai trees. Not to be misse..d! This is a heaven for Werther's Original and caramel lovers. You can find an assortment of yummy caramel coated delicacies. Yummy! Cute model of Füssen in Germany. There are miniture trains running around and display is really calm and nice to look at. I really like this shop. It has a wide variety of Chinese items that are very interesting and beautiful to watch (and purchase)! :) Check it out! This is a really good movie about the beauty and culture of China displayed in a 360 type theatre. It really gives you a good idea of what to expect and for me - gave me a strong will to visit China (which I think is the whole point of any Pavilion in Epcot). This is one impressive of world famous Terracotta Army! Highly recommended! This is nice place that's dedicated to Coca-Cola. You can try some very unique tastes that I haven't tried or seen anywhere else which are suprisingly good!! It's also a wonderful place to get some refreshments when it's hot out side. Definitely worth a visit! Wonderful ride that takes you though the history of communication, from ancient times to (relatively) modern era. It's really fun and relaxing to watch, the soundtrack is beautiful and there is cute interactive game near the end of the ride which made us laugh. Highly recommended! This is a nice diverse presentation of sea life. Recommended. For something called Journey into the imagination I expected much more. I remember seeing the original version in the early 90s and it was so much better. This one looks very dated and frankly .. just boring and not very imaginative. The song is cute and so is Figment who deserves a much better pres..entation since he is Epcot's mascot. It's a nice movie about the environment, but honestly I expected much more. The presentation video quality isn't great and there is nothing special here. WOW! This is the only way to describe this parade. The floats are beautiful, the music is great and there are tons of popular Disney characters to shoot and meet. There is also a huge dragon that spits fire from time to time. This is how a parade should look! Not to be missed! Let's start with Erik's castle- it's gorgeous to look at. The ride itself is very entertaining with all the beloved scenes from the animated movie. For me the star of this ride is Ursula rather than Ariel. She rocks! and she's hugggge! Very nice! The Incredibles can show know how to throw a party. It was a very nice one indeed although there weren't a lot of people by the time I got there. Still it's fun! This is a very speciel interactive show where the audience takes part. The stand-up relates to the audience and the actors are great. The monsters are rendered in real-time but in movie quality which is astounding. Because each show's success is based on the playfulness of the audience, it can reall..y be different each time. I was lucky to have been a part of a very nice group and the show was hilarious. Recommended!! 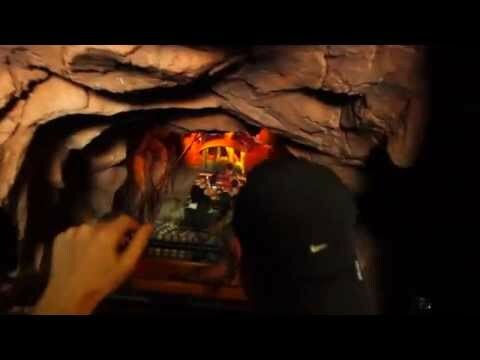 Fun interactive dark ride where you get to join Buzz and fight your way, shooting at different creatures in stunning scenes. This is one of the better versions of this ride. This is considered to be the best Magic Kingdom restaurant. It's unbelievably beautiful and you can select a place to seat in different sections of the Beast's castle. The food was very tasty: The French Onion Soup was delicious. Tuna Niçoise Salad was just great and cupcakes were delicious and not.. too sweet .. wow! You can also get a nice souvenir mug that you can fill to your liking. The restaurant has a winning combination of healthy and tasty food. WOW! This place is just magnificient and exciting to watch. Everything is situated inside a circus tent. From food to souvniers - everything here looks top notch. If you would like to shop around - I recommend this place!! This is a combination of a dark ride and a roller coaster. The roller coaster is really fun and the landscape is beautiful. The dark ride part felt a bit too short and the waiting times were hideous. To make your wait more enjoyable there is an assormant of interactive games - a very nice touch! The.. dwarfs are animated in a very realstic and life-like way- truly impressive. Look for a surprise appearance by a famous character near the end of the ride. Don't count on the waiting times to be shorter when you get to the park or later in the evening - try and reserve a spot using FastPass as early as you possibly can. It's one of the most popular rides at the Magic Kingdom, but for no good reason other than the classic movie it's based on. The wait times are always huge and the ride itself doesn't justify it. It's still beautiful to see London from above and the music is lovely, but that's about it. This is an OK ride. It pales in comparison to the Tokyo version and not very interesting. If you don't need to wait - go for it, otherwise - there are better rides at Fantasyland. This is one of the most elaborate meet and greet experiences ever created. You get to take part in a play that Belle will later see, go through the magic mirror and finally meet Belle. Very impressive! If you're into healthy food - there is certainly something for you here. The food is nothing to write home about, but still good. Explore Tom Sawyers island at your own pace. There are some nice views from the island- you can see Liberty Square, The Haunted Mansion and Big Thunder Mountain. There are much better attractions out there and there is nothing really exciting here ex..cept for the views. The mazes are pretty boring and easy to solve..
Splash Mountain is just a delight to your eyes and ears. It is so much fun. The dark ride parts are facinating and cheerful and the surprise drop really does surprise me each time. - Waiting times for the attraction can be huge so it's best to get a FastPass for ..this. - Ride this when the sun is out.. as you'll need to dry. - Ask to be seated at the back of the log/ride vehicle if you don't want to get wet that much. This is a really fun cruise through a jungle with animatronic animals. That gives you a lot of photo oppertunities to catch some wild, funny shots. The cruise itself is as funny as the Skipper makes it so your experience will be different each time. Our Skipper this time just OK.. but still we had a.. lot of fun. This is the classic version for better or worse, so you don't expect to see any Disney characters like in the Hong Kong version or enhanced special effects like the one in Tokyo. Visiting the Magic Kingdom is an amazing experience. You'll have to spend two days to really appreciate what this wonderful theme park has to offer. The highlights here are the new Fantasyland which is magnificent with the Seven Dwarfs Mine Train, Prince's Erik castle and Be Our Guest restaurant. T..he attention to detail at the new land is truly impressive. Also unique to this park is the Storybook Circus which includes the popular Dumbo the Flying Elephant (there are two of those actually) and a surprisngly fun shopping experience. Liberty Square is a unique land at the Magic Kingdom which, for me, is a sort of a mixed bag. On one hand The Hall of Presidents is an impressive attraction, but the land as a whole feels a bit out of place in the otherworldly tone of the theme park. Using FastPass+ you'll be able to reserve attractions, dining experiences and more in advance. It's a huge advantage and saves a lot of time when you're actually there. The Magic Kingdom is truly magical! Disneyland Paris is one of the better looking Disneyland parks in the world. It has a very unique tomorrowland and the beatiful out-of-this-world castle of the Sleeping Beauty together with a huge surprise at the dungeon under the castle. The Fantasyland of Disneyland paris is just magnificent and t..he attention to detail is amazing. The downside of the park is that it rarely renews itself and the attractions stay the same. If you're not into the latest attractions and into the classic takes - this will be a wonderful experience. It's a nice attraction at the entrance to Adventureland, but not really exciting and ultimately forgattable. The line that leads up to the attraction is wonderful and so is the decor. The attraction is nice, but that's about it. Not very exciting. It's a nice place to eat launch. The food selection is nice and the atmosphere really make the experience more exciting. This quick-service food is delicious, but more than that - I really like the idea that everything is inside a tasty bread cone. Recommended! This is a wonderful way to learn about the magic of animation. There's also a nice exhibition with some rare sketches and character design from the beloved Disney movies. This is an amazing oppertunity to see real-life sets, wardrobe and learn about the behind the scenes magic that went into the making of the wonder Harry Potter series. A nice day trip from London that is well worth the time. Hugely recommended! No matter how many times you try The Twilight Zone Tower of Terror - the experience is always different and remains one of the best at the park. Pretty intense fun!!! RC Racer looks pretty innocent from a distance, but once you get close - you realise you're in for one hell of a ride. This is one of the top attractions at Walt Disney Studios and definitely one you won't like to miss. Toy Soldier parachute drop provides a nice way to see the park from above. It's not very scary (I'm usually afraid of such attractions) and not very exciting either. We waited 2 hours for this roller-coaster so our expectations were very high. Fortunately, it didn't disappoint. This roller coaster is such a unique experience. You swirl, you laugh, it's fun!!! A lot of fun, and the exterior influenced by steampunk aesthetics is just beautiful. With the wonderful song of the Sherman Brothers this is not to be missed. It's not better or worse than other "it's a small world" attractions around the world, but the facade here is really nice and the loading area it outside. Cute walkthrough attraction. Not recommended if you're in a hurry because you might get stuck at the maze and spend more time than you intended. Nice relaxing cruise that lets you see more of Adventureland and take a break from all the action around you. This darker version is different from other versions of the Haunted Mansion. It's a really great ride and all the ghostly creatures were fun to watch. I liked Adventure Isle. It was a great place to explore and view was superb. Themed around the Indiana Jones movies, this cute little roller-coaster has a fun loop and nicely themed surroundings. I went on it twice since the lines were short (I recommend going in the evening). Pirates of the Caribbean is a fun ride. The ride itself isn't influenced by the movies and doesn't have all the additions of the other Pirates of the Caribbean at other Disneyland parks. Still, If the aren't too long - it's at entertaining ride. A walk-though attraction showcasing a few scenes from Aladdin. Not very exciting and not very interesting. An extremely beatiful restaurant with some of the best service I've ever seen. The food was really great although a bit on the expensive side. Recommended!! Actually a store to find western type food. Not very exciting. This is a great shop to buy unique Mystic Manor gifts. The merchandise itself is very attractive. Highly recommended. A good general store for stays. Here you'll find gifts and merchandize mainly connected to The Little Mermaid. The true attraction here is the actual store in the shape of Monstro the Whale which looks absolutely amazing!! At the beautiful Nautilus Gifts, you'll find unique souvenirs themed to Mysterious Island. These are very nice souvenirs that are not necessarly Disney related (which I liked). The external decor of the attraction is unbelievably fantastic, which led me to expect a terrific and exciting show inside. Sadly, that wasn't the case. The show wasn't interesting and whole experience felt awkward. This show was pretty good. It also includes some moments from Pixar movie, but the stars here are defenietly Mickey and Minnie. Simply spectacular water parade. One of the most impressive I've seen and it includes some highly detailed imaganitive floats and wonderful characters and costumes. Not to be missed!! You can view this water parade up close or if you're lucky enough from your room at Hotel MiraCosta. Tokyo Disneyland is truly wonderful. It includes some top-notch unique attractions like Pooh’s Hunny Hunt and a retro looking Tomorrowland (sounds weird, but yes). The park is pretty big and the castle here is the huge castle similar to the one in Florida. I had a wonderful time here- everything i..s well kept and its a joy to just walk around the park. The parade here was just excellent, big and impressive. If you’re in Japan- be sure not to miss this park! Universal’s Island of Adventure is a magnificent theme park. The park has wonderfully themed lands with its highlight being The Wizarding World of Harry Potter. There are some really wild rides here to enjoy like the Dudley Do-Right Falls and the Amazing Adventures of Spider-Man at Marvel Super He..ro Island. I really enjoyed the adventurous atmosphere of the park and just the beauty of walking and seeing the beautiful lands.The Seuss Landing land is really really nice. Highly recommended! Tokyo DisneySea Hotel MiraCosta is a beautiful hotel. While the conveniense of having the hotel inside the park is great, the room was surprisingly very basic for the premium price you pay for. I can recommend this hotel only if you get a the view of the Porto Paradiso side, which lets you view the ..water parade from the convenience of your room. Otherwise, the view from the room is nice, but it's disappointing considering the quality of the amenities and size of the room. Also - you need to make your order almost a half a year before your trip if you'd like to get a popular room. Simply put - this is hands down the best Halloween event in the world. Geared towards a more mature audience. I got really scared by the different mazes. The mazes were very detailed and scary. Loved every minute there!! I really like Space Mountain. You really feel like you're flying through darkness and spicy vistas. The Hong Kong version is very similar to other Space Mountains. Recommend. This place offers really great and versatile breakfast buffet. As added bonus you get to meet the one and only Mickey Mouse. I recommend trying the Chinese dishes! The breakfast buffet is nice, but I can only recommend eating here if you would like to meet the Disney characters. For a much better value try Chef Mickey (and you get to meet Mickey there as well). One of the better places for some eye catching special photo-opportunities. The shop is great for everything Toy Story related. Don't be fooled by it's cute look - this is one wild ride :) super-fun. Orbitron has a good balance between being a calm attraction and an exciting one. The attraction itself is beautiful to watch. Darkride with a twist. One of the few attractions that let's you compete with your friend which adds a lot of fun! Fun show! The songs are exciting. The concept and message here are great. It's also a unique show to Hong Kong Disneyland. Definitely worth seeing. Popular spot to meet cute Tinker Bell and share a moment. Very cute and versatile meet and greet area and one of the few places in the Disneyland park where you can see some Chinese inspired architecture. This is a great place to get a unique photo taken with western style dressed Disney characters. Really unique roller coaster combining an entertaining storyline and surprises. It's also unique to Hong Kong Disneyland. Not to be missed! Great place to chill out and get your picture taken. This Jungle cruise is fun ride. It includes some nice special effects near the end. I found the English speaking skipper not as goofy or as fun as the ones in the U.S.
Nice attraction. While the tree and Tarzan's house are nice and all - the view from above is the real star. You can see the beautiful Adventureland (which is considered one of the largest Adventureland of any Disneyland park in the world). I recommend visiting during sunset time for an even better v..iew. It's a great show! The performance and the catchy songs are great. The show includes some dancing and puppetry creating a very colorful event. I recommend it! It may be a bit shorter and less extravagant than other parades, but you can get up and close with the action and really feel a part of the show. This is nice, but not very exciting. There are better photo-oppertunities near by. This was simply amazing!! The music.. the effect... everything! A must for everyone. 4 Comments | Was this review helpful?